This is Down On The Street Bonus Edition, where we check out interesting street-parked cars in places other than the Island That Rust Forgot. I just drove to Denver, so let's admire a Denver survivor! I didn't take these photos, of course (I'm still being lazy, the day after my grueling 11-hour Ely-to-Denver jaunt). 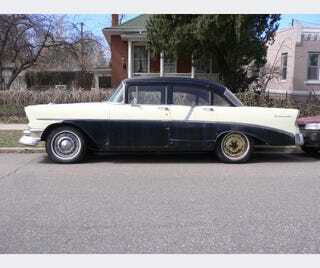 We can thank frequent Denver DOTSBE contributor Kitt for finding and shooting this beautifully battered '56 for us. These days, you're most likely to see a '56 Chevy in pristine condition at a car show, probably with a Time Out Kid leaning on it and "The Book Of Love" playing on the PA for the 19,232nd time. It's refreshing to see one that clearly gets daily driving action at age 53.